I got sent this yesterday and it cracks me up. For every woman reading this, I’m sure we’ve all heard the classic “Chicks before Dicks.” This puts a whole new spin on it. 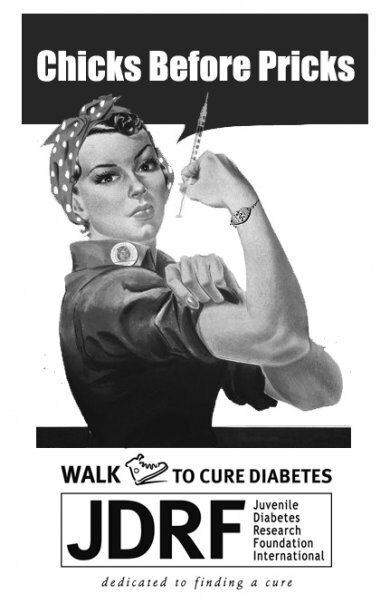 For the first three years of diabetes, I felt like having diabetes was so rare that I’d never find another person with it. All of a sudden Bartlett’s mom was on the phone with my mom because she’s six too and we live in the same town. As we grow up, we go to Camp Carefree where we each meet our very best friends: more chicks with whom we can talk about this crazy thing that happens in our little bodies. We can talk about everything else too. This isn’t to say that the guys at camp aren’t great, but they haven’t been the ones to stick around. At times when I’ve needed them, they’ve been there and they’ll come flying in and make a scene in my diabetes life, but “chicks” are the ones who make surviving with diabetes every day possible. Where I’d be without them? I shudder to think of such a thought. The guys, I could take or leave them and might not really notice. The thing that I’ve noticed too though, is that the people in my life without diabetes, the men are the ones who understand it better (at least the way I seem to need them to understand it). They are the ones who don’t nag, but ask clarifying questions and want to know more. They are the ones who when I’m out drinking with them and I go low, they’re the ones fighting at the bar for Sprite for me. They are the ones who understand that leaving all the people who know, love & understand you is more important in a diabetes aspect than a “personal” aspect. They are the ones who surprise me every day and give me hope.